Strategic Sourcing Management examines procurement and supply management in detail, covering the three dimensions of competitiveness, effectiveness and efficiency. Written by Olivier Bruel, Professor Emeritus HEC Paris, and a team of contributing experts from academia, consulting and industry, the book is organised into four parts: strategic decisions; operational management of procurement and related supply chain; management of human resources and dedicated information systems; management of performance and change. This book has been written with a comprehensive global and coherent approach but the chapters are self-standing, enabling the reader to dip into different sections according to need. Strategic Sourcing Management considers both tactical and strategic perspectives that link with a corporate strategy and it includes dedicated chapters on how to set up a Strategic Sourcing function. The text is enriched with clear graphics and solid examples of best practice. 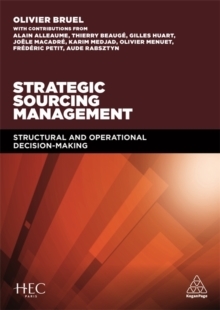 Strategic Sourcing Management is a robust text based on both research and experience, so an essential reference for practitioners and academics working in or studying procurement and supply management. It is suitable for anyone involved in procurement and supply management at a senior level but also for general management enabling them to understand the mechanisms of value creation through Strategic Sourcing.